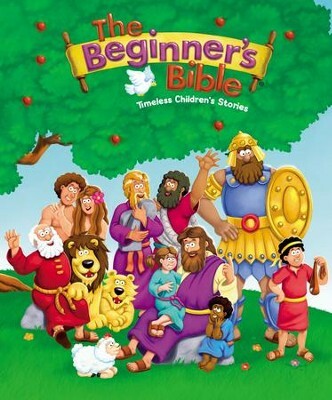 Toddlers will love this special edition of The Beginner's Bible designed just for them! Created for tiny hands to carry with them wherever they go, it features a smaller size, a carrying handle, and an easy Velcro closure. Toddlers will come to know and love the key stories and characters of the Bible with this well-loved Bible storybook. Updated with vibrant new art, text, and over 25 stories, The Beginner's Bible is the perfect starting point for children. Toddlers will enjoy the fun illustrations of Noah helping the elephant onto the ark, Jonah praying inside the fish, and much more! Recommended for ages 2 to 4. Millions of children and their parents cant be wrong. The bright and vibrant illustrations enhance every word of The Beginners Bible® to produce one of the most moving and memorable Bible experiences a young child can have. The Beginners Bible is where a childs journey towards a lifelong love of Gods Word begins. Kids will enjoy reading the story of Noahs Ark as they see Noah helping the elephant onto the big boat. They will learn about the prophet Jonah as they see him praying inside the fish. And they will follow along with the text of Jesus ministry as they see a man in need of healing lowered down through the roof of a house. Parents, teachers, pastors, and children will rediscover these beloved parables and so much more as they read more than 90 stories in The Beginner's Bible, just like millions of children before. The Beginners Bible® brand has been trusted for nearly 30 years, with more than 25 million products sold. From First Communions to birthdays, Christmas to Easter, The Beginners Bible is not only a wonderful gift for any child, it is one of the most trusted Christian resources for Sunday school and homeschooling. Is a highly-trusted, highly-recommended addition to the Beginners Bible brand, with over 25 million products sold. I'm the author/artist and I want to review The Beginner's Bible: Timeless Children's Stories - eBook.